After a record-breaking 29 points, "Showtime" Shoni Schimmel was named the 2014 WNBA All-Star MVP. Read her story. The Ogwumike sisters hosted a live chat with Tamika Catchings and Maya Moore during Friday's All-Star Practice Session. Watch as Shoni Schimmel makes an unbelievable 360 circus shot over Brittney Griner. Shoni Schimmel scores an All-Star game record 29 points as the East win 125-124 in the first overtime in WNBA All-Star history. 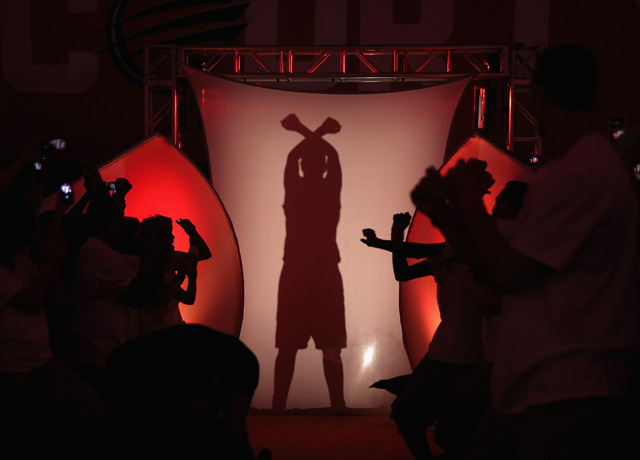 Take slowed down look at the All-Star Game 2014 through the lens of the WNBA's Phantom camera. Rookie Shoni Schimmel puts on a record-breaking performance, scoring 29 points to help the East beat the West 125-124 in overtime.